Murder mystery party games - that YOU host and join in! 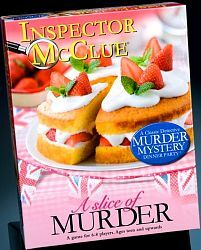 We sell a fantastic range of murder mystery party games that allow you to host an evening of great entertainment. Some games come in a box with all the material you need, whilst others can be downloaded so you can print them off yourself. We are based in Buckinghamshire in the United Kingdom and ship the boxed games all over the world. Gather some friends, dress up and act out your character. Play your character throughout the game whilst trying to guess who the murderer is. Don't forget to try and deflect all suspicion from yourself. Boxed games get delivered directly to your door. Download games are in an electronic format and will need to be printed on a home or office printer. The buttons on the left near the top, let you choose the number of players in your game. As the host of the party count yourself as one character and then count how many friends you want to invite, this will give you the total number of people (suspects) in your game - you can select the number of players on the left. All of the games sold here (apart from Death Wears White), allow the host to be any of the characters in the game. Then select a scenario you like and purchase your game. Where games say 'adults only', this is a recommendation by the publishers, as the game will contain saucy comments which are adult in nature. The games that are suitable for 'teenages and adults', have a mystery written for adults (or clever teenagers), but no saucy dialogue that may offend. Players slightly younger than teenagers have played these games and whilst they have not been able to track down the killer, we have had many reports back that they have had a great time getting dressed up and playing the characters. Every murder mystery party game contains a booklet or (slips of paper) for each of your characters. DO NOT LOOK inside the booklets before the party as they contain information that should only be read on the night of the party. Do however check that you have 1 booklet for each character and keep these in a safe place. The games also contain invitations to be sent out to your guests - these will give a little insight into their character and give an idea of what the character may dress like (please note that this is optional and your guests may like to bring a prop, instead of dressing up e.g. a librarian could bring a book). Each game will also contain a host or party planner guide, this where possible should be read in advance of your party as it may give you meal ideas and gives you an idea of how to run the party. The main aim of the evening is to have fun!!! Some of the murder mystery games contain a CD or DVD. These can be played at various points of the evening to help set the scene of the scenario, or to provide extra clues. Although traditionally these party games are played over a meal, not everyone hosts their party in this way and some hosts prefer to provide snacks instead. Indeed when you have 14 players in a game, organising a meal for 14 people can be rather hectic! You could always ask each of your guests to each bring a dish, or phone up for a takeaway, or put on a buffet and get people to serve themselves. The possibilities are endless! Now away you go Inspector.... the rest is up to you!